A trash can filling up. A pile of uniforms after soccer practice. Leftovers from a football watch party in the fridge. Those old drawers in your grandmother’s vintage armoire. What do all of these things have in common? On the bright side, these things equate to the love that pours from our homes. However, from all of these good memories flows the stench of household odors. Don’t worry, this is a completely normal nuisance and one that can be quickly taken care of. 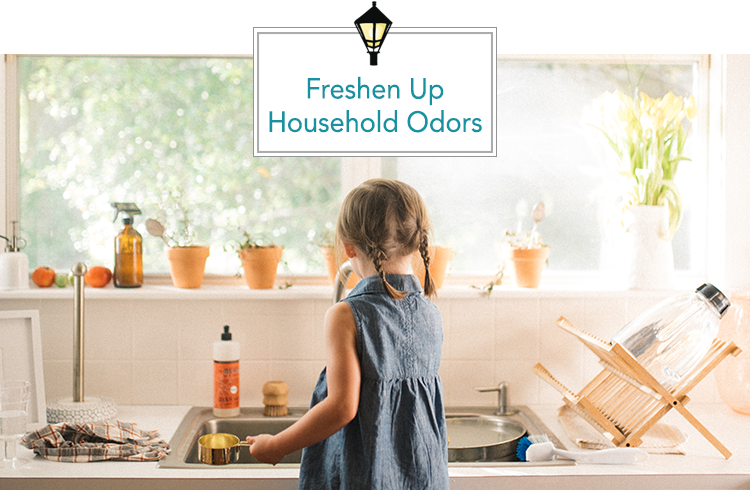 Keep your home smelling fresh and inviting with our simple tips on how to get rid of household odors. Refrigerator: After cleaning thoroughly, place a cut lemon on a shelf or leave an open box of baking soda in the back. Freezer: Like the fridge, leave another box of baking soda in the back. Garbage Disposal: DO NOT put fruit or veggie rinds down the disposal unless you want to call your plumber soon. Cut up a lemon instead and drop it down the drain along with a few ice cubes and turn on the disposal with running water. You can also do this by pouring a cup of bicarbonate soda and two cups of vinegar down the drain. After this bubbles for a few minutes, rinse repeatedly with warm water. Maybe the most obvious culprit, your garbage cans are literally made to hold smelly items. This is especially true after one of your famous crawfish or low country shrimp boils. Luckily, the solution is simple. Take your garbage can outside and hose them down. Then rinse and clean with warm water and white vinegar and hose it down again. Once it’s dry, leave a few dryer sheets or some coffee grounds in the bottom to neutralize future smells. Ah, another obvious odor zone. A hip way to fight these smells is with essential oils. Yep, the same ones you use to calm your nerves and your stomach. Place a few drops of cinnamon or orange essential oils in the tube of your toilet paper roll or on cotton balls that you place near the toilet. This will greatly alleviate normal bathroom odors. For the unmentionable smells, try this DIY spray recipe. We all know that smell that wafts out when you open a drawer or a cabinet of an old piece of furniture. An easy trick to absorb this odor is to pour a few drops of vinegar on crinkled up newspaper and place this in the drawer on a shelf. After a few days, the odor will have been sucked up, and now you can leave a couple dryers sheets or tea bags behind to keep it fresh. The average person gets eight hours of sleep. Since we spend around a third of our days in the bedroom, it needs to smell incredibly fresh. This starts with your mattress. Spread a couple of cups of bicarbonate soda over your mattress, let sit for 30 minutes and then vacuum the mattress with the brush tool. This will make your bedroom smell fresher and help you sleep better at night! Or, you can diffuse essential oils to cleanse the air, lavender is one of our favorites!